One month ago Bob Moriarty, Founder & Editor of 321gold, stated in no uncertain terms that we were in for a deeper correction in the precious metals space before we would reach a monumental buying opportunity. We ended up with a messy trading range in gold and the gold miners during the month of September. However, October has gotten off to an ugly start for precious metals and it looks like Moriarty is going to get his deeper correction after all. Given the tumultuous market action we thought it was a good time to get Bob on the phone again; we managed to connect with Bob for a quick update as to what he’s seeing out there and how deep he expects this correction to be. As always Bob was blunt and to the point. CEO Technician: We last spoke exactly one month ago and you made it no secret that you were expecting a correction in the metals & mining shares. Today the GDX is down ~8% as I say these words and gold itself is down more than $30/oz. Is this the correction? And if so, how much farther do we have to fall before we reach a bottom? Bob Moriarty: We need to see more speculative froth unwound. We aren’t there yet. I was hoping the tumble would start sooner and we would be at, or close to a bottom by now. I still see another 2-4 weeks ahead for this correction. 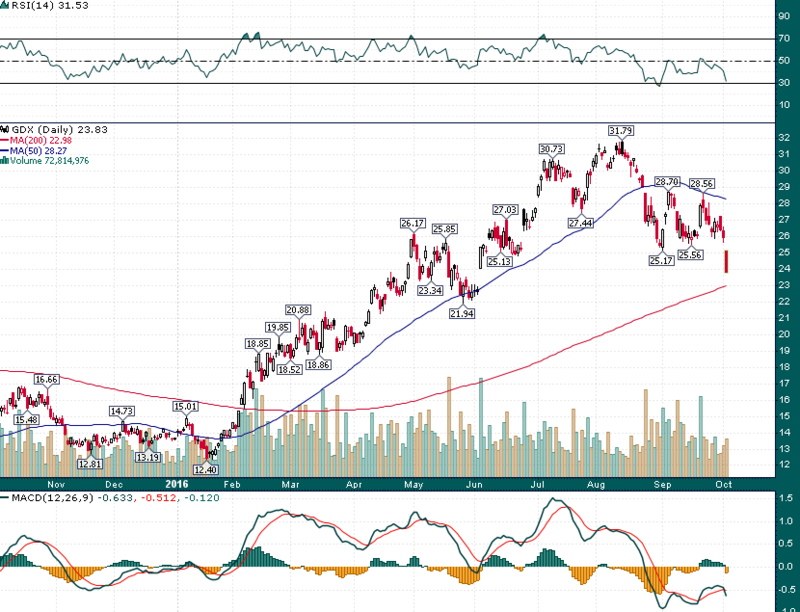 The 200-day moving average in the GDX and the HUI offer a place from which the first oversold bounce could take place. However, I think we will still have to probe lower levels over the next few weeks before a sustainable bottom is put in place and investors will have the green light to load up the truck again with mining shares. CEO Technician: You know I like to talk about specific levels and time frames, and I know you don’t profess to be a market timer even though you are quite good at it. Around what levels will you be looking to add to your gold & silver positions? Bob Moriarty: I want to see gold down at $1150-$1200 and silver at $15-$16. I am ready to buy silver at $16. With mining shares it’s not so much about levels for me. It will be time to buy when everyone hates mining stocks and the talking heads of financial media are negative on gold & silver and have nothing good to say about the gold miners. There were too many people who jumped on the gold bandwagon over the summer and we are just beginning to see some of these people puke up their shares. There is still more to go before we reset the market enough to see another 100%-150% advance in the gold mining sector. However, I expect a monumental buying opportunity to present itself within the next month. Until then the hardest part is to be patient and not do something stupid. The primary purpose of our call with Bob this morning was to update readers on his latest market thoughts and also to keep ourselves disciplined. When we see multiple high quality stocks down double-digit percentages in a single day the temptation is to jump in and buy “on the cheap.” However, that’s usually not the right thing to do. Disciplined investors with a well thought out process stand to do very well over the coming months as market volatility offers opportunity to those who are positioned to capitalize on it. We would like to thank Bob for his time and candid market views. To find out how CEO Technician is trading the volatility in precious metals and mining shares subscribe to his premium service and receive daily morning market emails, access to a real time trading lab with live trade updates and market analysis, along with a junior mining model portfolio. DISCLAIMER: The work included in this article is based on current events, technical charts, and the author and Mr. Moriarty’s opinions. It may contain errors, and you shouldn’t make any investment decision based solely on what you read here. This publication contains forward-looking statements, including but not limited to comments regarding predictions and projections. Forward-looking statements address future events and conditions and therefore involve inherent risks and uncertainties. Actual results may differ materially from those currently anticipated in such statements. The views expressed in this publication and on the EnergyandGold website do not necessarily reflect the views of Energy and Gold Publishing LTD, publisher of EnergyandGold.com. This publication is provided for informational and entertainment purposes only and is not a recommendation to buy or sell any security. Japan Gold Inc. is a sponsor of EnergyandGold.com and so some information may be biased. Always thoroughly do your own due diligence and talk to a licensed investment adviser prior to making any investment decisions. Junior resource companies can easily lose 100% of their value so read company profiles on www.SEDAR.comfor important risk disclosures. It’s your money and your responsibility. Moriarty is missing out on a great opportunity. Silver is a bargain @ $17. Correction or not. A simpler (and far better) calculus for deciding when to buy silver is the gold:silver ratio. Its a great time to buy silver right now. Today was my buying day as I stated last week I will buy every thursday but for some reason my payment wasnt received from last week yet so I will hold off and skip a week. :). This is a great spot for a bottom to be found, and methinks this is indeed the bottom. However, if stocks tank, they will likely take silver down with them. So I could see $15-16 silver again if stocks tank. Now having said that, if we see sub $16 silver again, I'll be liquidating as much junk as I can to buy some of that white metal! I welcome $16 with open arms! Currently GSR is 71.7 to 1.